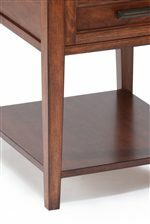 This lovely mission end table is functional and stylish. It has simple straight lines, with a drawers and a shelf for storage. The warm toffee finish will warm up your living room. Antique brass hardware is an understated touch. The Harbor Bay End Table With 1 Drawer and 1 Shelf by Magnussen Home at AHFA in the area. Product availability may vary. Contact us for the most current availability on this product. 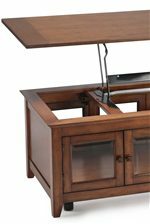 The Harbor Bay collection is a great option if you are looking for Casual Mission furniture in the area.